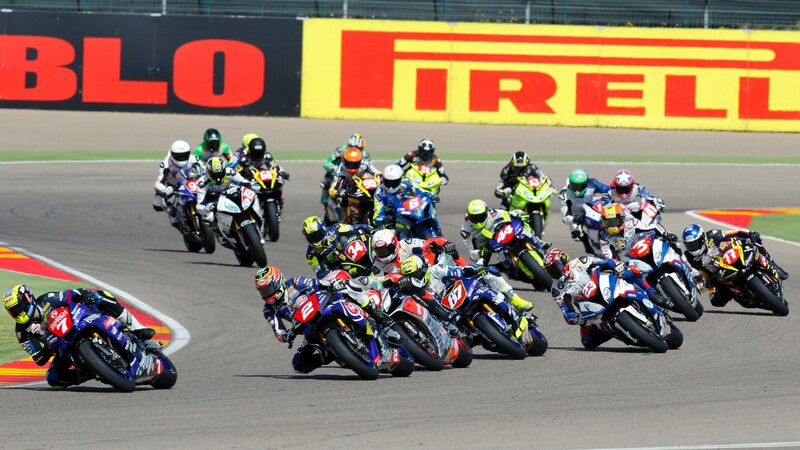 https://secure.worldsbk.com/en/subscribeAs Aragon approaches so does the debut round of the FIM European Superstock 1000 Championship, and 21 riders will line up in front of the lights on Sunday with a big battle on their hands, and a lot to play for. 2017 champion Michael Ruben Rinaldi departs to WorldSBK this season, leaving no reigning champion and no target for the riders this season. Nine nationalities, six manufacturers and fourteen teams, you won’t be short of variety in STK1000 this season. French rider Florian Marino sticks with a Yamaha for 2018, this season with URBIS Yamaha Motoxracing STK Team as the 24 year old looks at taking his debut victory in the class. Mr consistency in 2017, he will be keen to secure a victory early on this season as the class is a competitive one. Without his main rivals of 2017, he will be confident he can put on a good show this season and go one step further than the second position he secured here last year. Roberto Tamburini and Luca Salvadori will be taking on the BMW S 1000 RR machines with Berclaz Racing Team SA, as both former podium contenders will look at putting up a strong fight this season. The Italian duo’s history around MotorLand stretches back to Tamburini securing a victory in 2015, whilst Salvadori has a more difficult past and they will be a strong force into 2018. Previous STK1000 race winner Markus Reiterberger secures a full season deal with alpha Racing-Van Zon-BMW, as he comes off the back of taking the IDM title in 2017. Stunning the crowds around Lausitzring in his wild card appearance last year, he moves over with a familiar team and bike, meaning his pace will no doubt be strong from the opening round. Italian up and coming star Gabriele Ruiu takes on the Team Pedercini Racing ZX-10RR this season, as the 17 year old is set to make his debut on the world scene. Competing in CIV and CEV in the past, he comes to MotorLand understanding the circuit and his riding talent is strong enough that he will no doubt shine. Chilean talent Maximilian Scheib (Aprilia Racing Team) returns to the STK1000 field this season with Aprilia, and after 2017 full of points scoring finishes and three podiums he will be looking to progress and improve into 2018. Whilst Alex Schacht (EAB SCHACHT Racing Team) will be at the helm of the other Italian machine on the grid with the Ducati 1199 Panigale R.
Follow all the 21 riders on their mission of the opening round of the season, as the racing action kicks off at 15.15LT (+2 GMT).